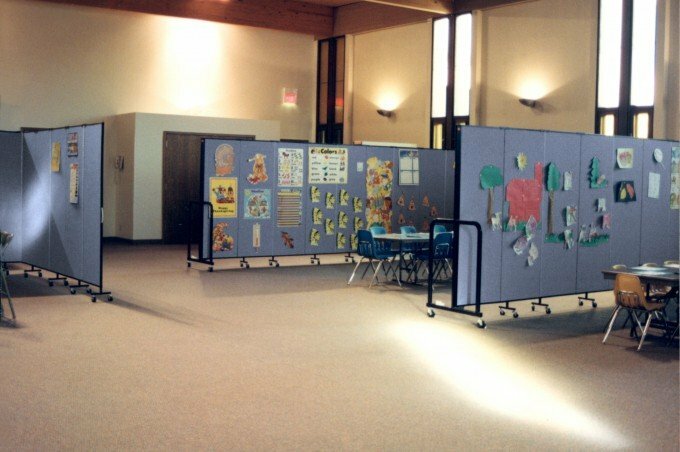 Uses: Church, Day Care, Fellowship Hall, Religious Colors: Blue Lengths: 9 panel 16'-9" Heights: 6'-0"
The administrators of this parish wisely use their freestanding dividers to help manage their daycare program during the week and to create Sunday School classrooms on the weekend. The room dividers separate the space into multiple classrooms for the students to enjoy. An open space is left in the middle of the room for the students to enjoy games and worship.